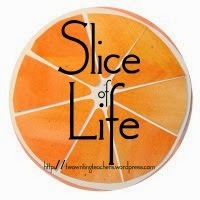 I'm slicing with the Two Writing Teachers community for Day Seven of Thirty-One of the Slice of Life Challenge in March. Thank you Stacey, Tara, Anna, Betsy, Dana, Kathleen, Beth, and Deb. 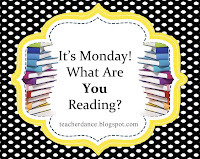 On Mondays I visit Jen at Teach MentorTexts and Kellee and Ricki at UnleashingReaders to see what they've been reading, along with everyone else who link up. I've been in love with Irene Latham's books for a long time. Irene is one of the first poets to reach out to me in kindness through our blogging. I was both surprised and flattered. If you don't know her work for both adults and children, look here at her website, Live Your Poem. She has published poetry collections for adults and for children, plus middle grade novels. Last year I loved and reviewed Dear Wandering Wildebeest and Other Poems from the Watering Hole, a beautiful look at a day at a watering hole on the African grasslands. Today I want to celebrate a book that celebrates its birthday tomorrow, a book that you will love for its ability to entertain a wide range of ages, including adults. 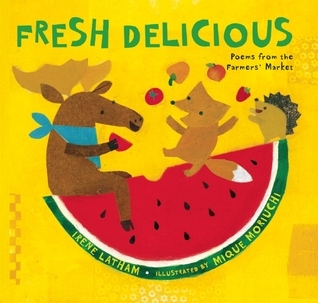 It is Irene's second book published this year (more about the first later), and it is titled Fresh Delicious: Poems From The Farmer's Market, illustrated by Mique Moriuchi's amazing and playful collage illustrations. 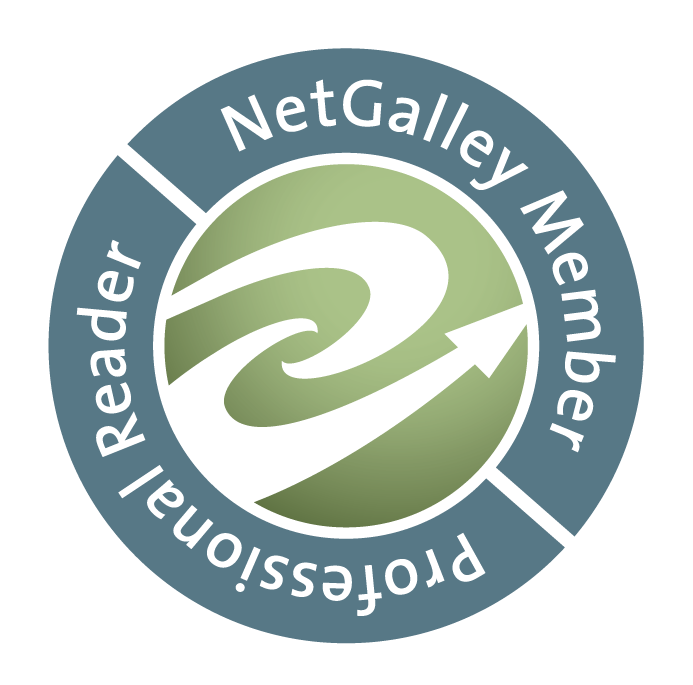 Here are two other bloggers who show their book love, too: Jama Rattigan, and Michelle H. Barnes. The twenty-one poems in this latest book by Irene mirror the title itself; they are "fresh" and "delicious". I become very excited when spring arrives and I know that our farmers' markets will soon open. I assume you get excited too, but when you go, did you know you might meet "a fleet of green submarines" (cucumbers), " a "mountain of mice-sized swords" (okra) or "rows upon rows/of tiny noses" (corn on the cob)? The metaphors delight, and I imagine that Irene's words will inspire you to create your own comparisons. In the poem Wild honey, Irene writes that it makes "our tongues/buzz/with pleasure." And, corn grows to the side on stalks so tall, as if it's "listening/to the/sun". Each poem opens the senses to new ideas about the fruits and vegetables found at farmers' markets. Not only mouth-watering to imagine through the words, the illustrations show off the food and the animals at the market in the happiest of ways. There is also a surprise at the back. After the delightful stroll through the market, Irene shares recipes that take advantage of market fare, just right for kids to help with the cooking. I'm excited to share Irene's answers to the questions I posed. Knowing that many teachers read my posts, I thought it would be great to ask Irene about her school visits. How will she present this book as a text to use when writing poetry for children? 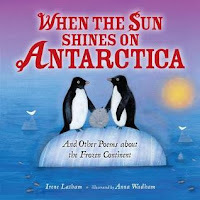 When you visit a class of young students to share the book, what will you do to spark their poetry by using this book? Because food is a part of everyone's every day life, this book offers a wonderful doorway to the world of poetry. Fresh food IS poetry, and farmers are also poets – instead of pencil and paper, they use hoes and dirt. Farming is an act of love. And isn't the sun's love and the rain's love and the soil's love the very things that transform a tiny seed to a shoot to a plant that blooms and bears fruit? More specifically I will share with students how these poems have been called “odes” because they are love songs that celebrate each fruit and vegetable. It's a way to show how thankful I am for each one, and students can do this, too! Choose a fruit or vegetable and think about all the ways you are thankful for that fruit or vegetable, all the ways you love it – from seeing it to touching it to smelling it to tasting it to hearing it to that feeling when your tummy is full. Use all your senses. Also, I will share one of my primary goals when I was writing these poems: to bring action to these still objects. Most often fruits and vegetables are portrayed in art as Still Life, so one way to be “fresh” when writing a poem about a still object is to give it movement, action. So that became a focal point for me: how can I use images and words that portray these fruits and vegetables in action? Finally, I will share a technique that has served me well in many poetry projects, including this one. It involves looking at objects very closely, and from different angles and vantage points – sometimes alone, up close. Sometimes far away, or with a group. I use The Private Eye http://www.the-private-eye.com/index.html method of inquiry and ask myself, What does it look like? What else? What else? I keep asking myself this until I have a whole list of images. They I go back through the list to find the freshest, most delicious ones. The poem “Basil” emerged in just this way – it's just 7 words plucked from a list of observations. And do you have other experiences to suggest doing with the students that will enhance their writing and enjoyment of the poems? I will be sharing my thoughts on this at schools and conferences like Fay B. Kaigler Children's Book Festival Hattiesburg, MS) https://www.usm.edu/childrens-book-festival and Texas Library Association http://www.txla.org/annual-conference in the next couple of months. Invite a farmer to come and share about the farming life and farmers' markets. Take a trip to the Farmers' Market and complete a FRESH DELICIOUS scavenger hunt! (Available on my website.) Here is the link! Food, Art, Play! - Pair with HOW ARE YOU PEELING? 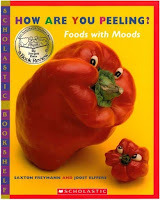 By Saxton Freymann and Joost Elffers and use cut bell peppers and other fruits and veggies to dip in paint and create stamp-art. Food Science – Create a tongue taster map and use FRESH DELICIOUS fruits/veggies as samples. G I Y (Grow It Yourself) Kids – Use as part of a gardening series to plant seeds for fruits and veggies. To celebrate Irene's poetry, I'm offering a giveaway of still another wonderful book by her that was published just a few weeks ago. This too is a non-fiction poetry picture book, filled with beautiful poems from another place in the world. 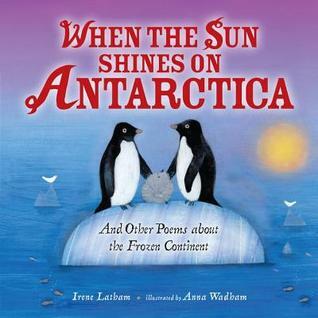 Like Fresh Delicious, Irene offers a "fresh" look at one of the coldest places on earth: When The Sun Shines On Antarctica and Other Poems about The Frozen Continent. I'm willing to give away one of the copies of this book. Enter Below! And leave a comment sharing your favorite "fresh" food found at your farmer's market. I love this post! Thank you for sharing about this author and this fun poem book about farmer's markets. My favorite thing to buy at farmer's markets is tomatoes. They are just so much better than what I can get at the supermarket. Thanks for coming by and sharing about your own favorites, Andrea. They are better! We love how you incorporated an interview with the author into this post. We can't wait to read Fresh Delicious and think about spring at the farmer's market. Thanks Clare. Spring is on its way, and that means going to the market. Irene was wonderful to answer my questions! And it's great to have a lesson all ready for April with a lovely new book. I love how she says she wants to make the food come alive since they are often viewed as still life. What a fun book! It will be a great book to share with kids, especially in April, poetry month and time for spring plantings (for some of us) and thoughts of Farmer's Markets. Thanks Elsie. Fresh Delicious does look delicious! We planted our first seeds in the garden this week. Maybe as the spinach grows, I will grow some poetry alongside of it! Wonderful that you're starting your garden. As I've said often these past weeks, our unusually warm weather means lots of green is showing. I just hope we don't get a winter blast later on. Yes, the book is lovely, just "ripe" for spring. I always learn something new when I read author's comments. Thanks for including them in your post! You're welcome, Michele. They are good ideas, aren't they? Thanks for sharing this book and including Latham's interesting perspective and experiences! I have lived in places before that had wonderful farmer's markets, but here, not so much. I think the worst produce to buy at the grocery store has to be tomatoes and peaches, so those are my favorites to get from the farmer's market. I'm worried about a winter blast too--just noticed that my lilacs are starting to bud. Good grief! Oh my, you made me go out and look at my lilac, and you're right, small green buds are there! Our early markets have people coming up from the south, but later in the summer, there is some fine Colorado farm produce. When the western slope peaches come in, our groceries have them, too, but tomatoes, rarely good, I agree. Irene's ideas to use with her book will be fun to use. I'm glad you enjoyed them. I've been such a fan of Irene, too - a gifted poet, and a lovely person. Thanks for showcasing her work today, Linda...hope those lilacs are holding up! Well, the lilacs seem to be arriving, and then will hope they stay until May! Thanks, Tara, hope you enjoy Irene's books when you get them. You'll welcome, Amy. Thanks for coming by and for sharing! So glad it's enticing you, Julieanne. Thanks. I understand about the cost. 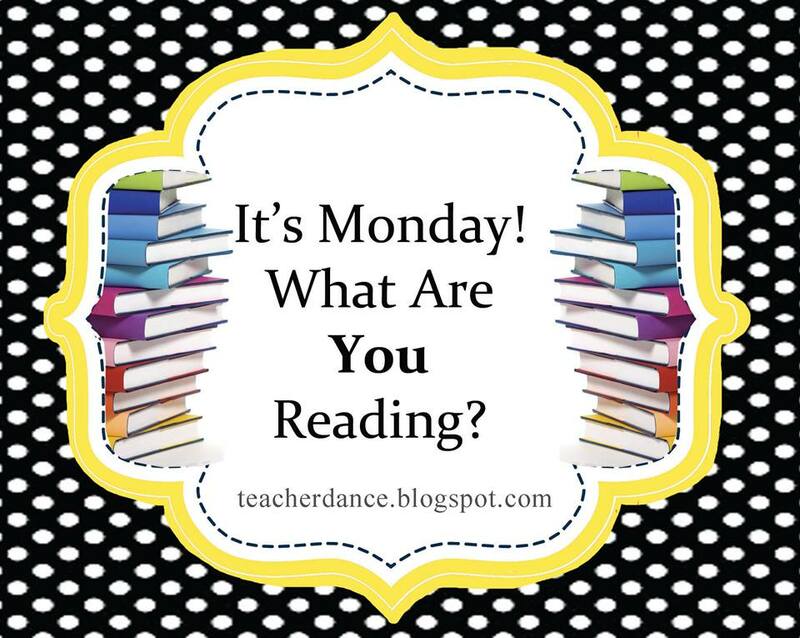 I've found more books shared on the slice of life, plus I read the others, too. I just received a copy of Fresh Delicious last week and am looking forward to reading it. Terrific, Beth. Hope you love it! I want to thank you for introducing me to Irene years ago. She sent me a poster of Fresh Delicious and I shared it with my kids today. I'll need to order the book soon. She is also a kind supporter of other poets. She tweeted my post today and made my heart sing! Of course, you're welcome, Margaret. I know you'll be working with her, right? The book is terrific. Such a delightful post, Linda! I think the book should be available in every farmer's market. You'll laugh because when I came back to comment, I accidentally ended up on yesterday's post. I couldn't figure out how we got from Fresh Delicious to talking about donuts! So funny, Ramona. I thought it was funny that I moved from sweets to better fare. Thanks! How wonderful the poet took time to help you celebrate book love, Linda! I've never read any of Irene's work, but I will definitely check it out. Reading Irene's book and then writing about it made me wish for summer all the more, Jennifer, and all those good things you mentioned. Hope you entered the giveaway! Love the farmer's market and what a delightful collection. I really liked the ideas you and Irene talked about at the end of your post. When I was in elementary school we visited a farm just outside of town. We got to eat carrots we picked and see flowers (fields of them) growing. I still have those images in memories. Thanks for the review! My granddaughter spent last year with her class studying food together. I wish I had had that book then to share with the class. Thanks, Lee Ann. My favorite fresh food at the farmer's market are the tomatoes that you can only get in August--the ones that you can sprinkle sea salt on and dribble on some balsamic vinegar and provide a full meal. We are doing poetry for our writing academy this summer--I'm bookmarking your post. Thank you. That's wonderful, Melanie, I hope you entered the contest. Yes, the tomatoes are so tasty then. Fresh Delicious looks wonderful and I definitely want to check out Irene Latham's website. Many of my students enjoy poetry, but I still don't think I spend enough time sharing it with them. Thanks for this awesome post. Have a great week! Thanks, Jana, I hope you'll find and love all of Irene's writing for children. 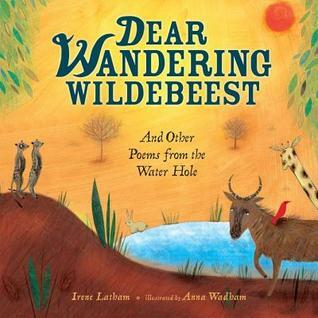 The poems are so enjoyable, and also great mentor texts for writing. Enjoy! So awesome that you had such a great interaction with this poet. How amazing of an experience to share. I LOVE fresh tomatoes! I could seriously eat them all day everyday. I will have to check out Irene and her books. Thanks for sharing! They are wonderful, Ana. I hope you find them all and enjoy them. You can see I love them! Thank you! I do not know Irene's books, though I have been seeing her Antarctica book everywhere, so I am intrigued! I love fresh tomatoes as well--they are delicious! Though, I'll be honest, I need to spend more time at Farmer Markets. I go nearly every Saturday, and there is a smaller one nearby that is on Sunday, or Wednesday too. I can't buy too much, just me, but enjoy the crafts, too. Irene's books are marvelous, Kellee, lovely non-fiction poetry. Thanks! Such an interesting post Linda. I so enjoyed "savouring" it! Thanks, Carrie, happy you did! Thanks for introducing me to this author! She has an impressive variety of publications. I'm excited to read more of her work. You're welcome Mark. I hope you enjoy them, and find some special to what you're looking for. Oh my, it really would, Crystal. 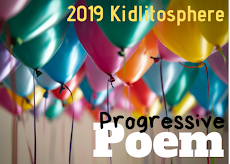 I hope you'll get it for your display, and then to share with teachers for poetry goodness! Thanks! Thanks, Ricki, how lovely of you. But, you need to find Irene's books and enjoy them with Henry! Can't wait to read more of her work. and check out her blog. Wonderful post Linda. Great ideas for using her book as well. I think it would be wonderful to be with Irene on a school visit, sure it would be such a great time! I loved Wandering Wildebeest - we do have the title in our library - not sure about the others, though. Better start recommending to our librarians. Very thorough review, dearest Linda. And loved the conversation as well. Thanks, Myra, more wonderful books for your library! You're very welcome, Irene. The book deserves lots of love. Happy Book Birthday! This is such a wonderful post, Linda! My students adore Irene's poetry. I can't wait to share Fresh, Delicious with them. Terrific to hear, Catherine. This is still another great book of Irene's.